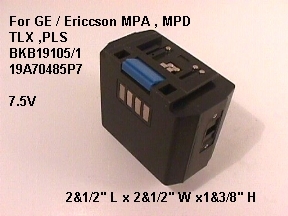 For GE , Ericsson 2 way radio battery,19A704850P7 , 19A704860P7 ,MPD , PLS , TPX , MPA , MTL. BKB19105/1 , BKB191205/3 models. Ni-Cad battery, 7.5 V , 1200 mah. Dimensions at 2&1/2" L x 2&1/2" W x 1&3/8" H. The battery is brought to you by Battery Barn, Your original charger will charge this battery.